Greene County, N.Y. (June 13, 2016) - Striking the balance between adventure and culture, Greene County&apos;s Kaaterskill Clove Trail offers a self-guided discovery route to hiking trails, scenic vistas, restaurants, and historic sites offering surprising connections between past and present. inspired countless artists for generations, and its stops represent key places in American history. The routes connect visitors to sites in the Catskills, while looping in some of Greene County&apos;s most popular attractions, restaurants, and microbreweries. Glens Falls, N.Y. - Kicking-off Adirondack Theatre Festival&apos;s (ATF) 22nd summer season of professional theatre is ISLAND SONG. Performances will be held at the Charles R. Wood Theater (207 Glen Street in downtown Glens Falls) June 21st - July 2nd at 7:30pm with a special matinee performance on June 29th at 2:00 pm. Tickets are $32-$45 and are available at the Wood Theater Box Office, online at ATFestival.org, or by calling (518) 480-4878. Discount season flex passes are available for the full seven show line-up. Get Ready for the 2016 Best 4th In The North Celebration! 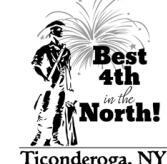 Ticonderoga, NY - June 2, 2016 - The Best 4th In The North Committee, a subcommittee of the Ticonderoga Montcalm Street Partnership is pleased to announce the schedule for the 2016 Best 4th In The North Celebration in Ticonderoga, NY with the theme "Hometown Pride - Think Local," The 2016 Best 4th In The North Celebration will take place July 1-4, 2016 with a grand fireworks display, parade, the Montcalm Mile, as well as a variety of live music, food, vendors, rides, games, and much more throughout the four day celebration. New food, music, and rides are being added. The Best Fourth in the North Celebration attracts many visitors to the Ticonderoga area every year, which supports many local businesses and the local economy as a whole. Greene County, NY (June 1, 2016) - Oak Hill in the Great Northern Catskills of Greene County will become a music-filled, open air concert arena during the annual Grey Fox Bluegrass Festival July 14-17, as 40 bands fill five stages to offer a weekend of incredible musical entertainment. Grey Fox Bluegrass Festival is a mainstay for the Catskills, attracting a who&apos;s who of bluegrass to jam for three days at Walsh Farm in Oak Hill. The weekend includes performances by more than 40 bands, including Bela Fleck & Chris Thile, Del & Dawg, The Earls of Leicester, The Del McCoury Band, The Gibson Brothers, Donna the Buffalo, and many more.